A result that shook the world, a rant for the ages and a motorsport interloper. It was a wonderful weekend of sport that threw up remarkable stories - and with so much going on you would be forgiven for missing a few of the best bits. So here is BBC Sport's selection of highlights from an amazing few days of action. Wakey wakey Japan. You've just beaten one of the greatest rugby union nations the world has ever known, why are you still in bed? Because it's 3 o'clock in the morning and it isn't on TV? Fair enough. Japan's 34-32 World Cup victory over South Africa was considered the greatest upset in rugby union, but it was not even broadcast live on Japanese television. Neutrals everywhere were egging on the Brave Blossoms as Karne Hesketh crossed in injury time to secure a stunning win in Group B.
Seijiro Takeshita, a professor at the University of Shizuoka, told BBC News that rugby is mainly played as a sport of honour, and not for money in Japan. The Brave Blossoms certainly held up the honour of their nation. Have you ever taken a wrong turn and ended up somewhere you never intended? How about strolling on to a Formula 1 circuit? Ever done that? One fan, by accident or design, found himself plodding down the track at the Singapore Grand Prix, which was won by Ferrari's Sebastian Vettel. Red Bull's Daniel Ricciardo, who finished second, said: "He was on his phone taking pictures, probably for Instagram or something." Referee Mike Dean riled Arsenal fans this week, but not as much as he wound up Garth Crooks. 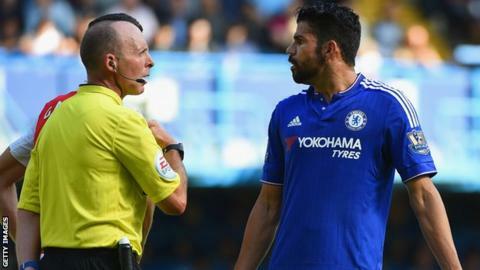 Dean infuriated the Gunners and their manager Arsene Wenger by not sending off Chelsea striker Diego Costa, following a number of off-the-ball clashes in Saturday's 2-0 win for the Blues. But nobody was as angry as former Tottenham forward and BBC Final Score pundit Crooks, who grew increasingly furious during his analysis of the dismissal of Arsenal defender Gabriel during the same game. According to Crooks, Dean has one fault: "He wants to be the star too often. It's not about you, Mike." "Gimme a break!" Is what poor Alison Lee must have been thinking when she scooped up her ball from the surface of the 17th green at St Leon-Rot in Germany on Sunday. America's Lee, playing in the fourballs in the Solheim Cup, thought her 18-inch putt had been conceded by the Europe pairing of Charley Hull and Suzann Pettersen - but it hadn't. While it was Lee who technically broke a rule, it was Pettersen who was lambasted as "disrespectful" for a perceived lack of sportsmanship. And the confrontation that followed on that 17th green left Lee and Hull in tears. The USA went on to produce a superb display in the singles to beat Europe 14½-13½, while Norwegian Pettersen issued an apology and explanation, saying: "I let my team down and I am sorry." Belgium, the home of waffles, ridiculously strong beer, Jean-Claude van Damme and now the Davis Cup final. Britain, once again inspired by the all-conquering Andy Murray, beat Australia 3-2 to reach the final of the 'World Cup of tennis', which will be against the Belgians in Ghent. The tie will be at the Flanders Expo Arena in Ghent, which in the past has hosted the biggest names in pop, including Elton John, Prince and U2 - as well as Belgian television's version of The Voice. It will be Belgium's first Davis Cup final in 111 years, and they earned it when Steve Darcis beat Argentina's Federico Delbonis in four sets in a deciding fifth rubber in Brussels.